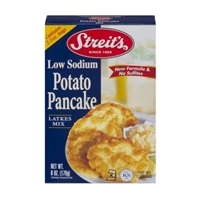 Brand/Manufacturer: Streit's Aron Streit, Inc. 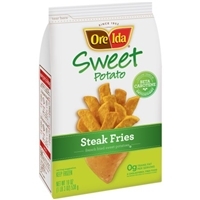 Potatoes (mono & diglycerides & sodium acid pyrophosphates), potato starch, onions, matzo meal (passover wheat flour & water), cottonseed oil, salt, potassium chloride.contains: wheat. 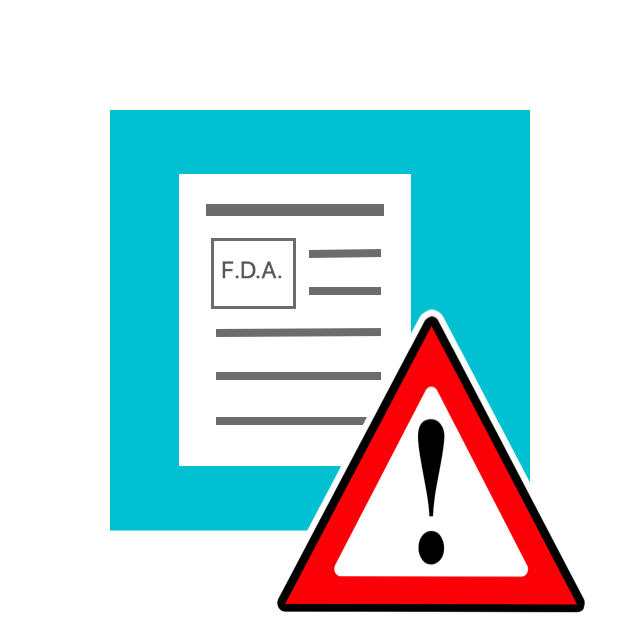 Sweet potatoes, vegetable oil (canola, sunflower, cottonseed, and/or soybean), modified food starch, rice flour, tapioca dextrin, sea salt, leavening (sodium acid pyrophosphate, sodium bicarbonate), xanthan gum, annatto (color), sodium acid pyrophosphate. 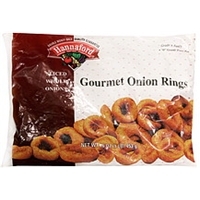 Onions, wheat flour, whole wheat flour, vegetable oil (canola oil and/or sunflower oil and/or soybean oil), cornstarch, dried cane syrup, sea salt, onion powder, natural cane sugar, yeast extract, garlic powder, guar gum.contains: wheat. Brand/Manufacturer: Safeway Home Safeway, Inc. 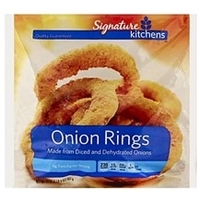 Onions and dehydrated onions, soybean oil and/or canola oil, enriched wheat flour (flour, niacin, iron, thiamin mononitrate, riboflavin, folic acid), water, wheat flour, yellow corn flour, cornstarch, sugar, modified corn starch, wheat starch, salt, sodium alginate, dextrose, dried yeast, color (caramel, oleoresin paprika), natural and artificial flavors, leavening (disodium dihydrogen pyrophosphate, sodium bicarbonate), nonfat milk, whey, sodium tripolyphosphate.contains: wheat, milk. 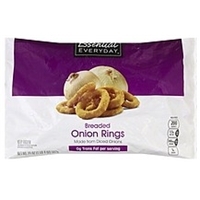 Diced onions, enriched wheat flour (wheat flour, niacin, ferrous sulfate, thiamine mononitrate, riboflavin, folic acid), vegetable oil (soybean and/or canola), water, yellow corn flour, modified food starch, corn starch, wheat flour, contains 2% or less of calcium chloride, caramel color, guar gum, leavening (sodium aluminum phosphate, sodium bicarbonate), oleoresin paprika, salt, sodium alginate, spice, sugar, whey, yeast.contains: milk, wheat. 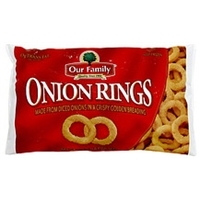 Onions, enriched wheat flour (enriched with: niacin, ferrous sulfate, thiamine mononitrate, riboflavin, folic acid), vegetable oil shortening (soybean oil, and/or partially hydrogenated soybean oil), cornstarch, bleached wheat flour, yellow corn flour, wheat flour, food starch-modified, water, sodium alginate, salt, potato starch, guar gum, sodium silica aluminate, leavening (sodium acid pyrophosphate, sodium bicarbonate), whey, calcium chloride, yeast, sodium tripolyphosphate, caramel color, oleoresin of paprika (color).ice crystals on frozen foods can cause spattering when added to hot oil. 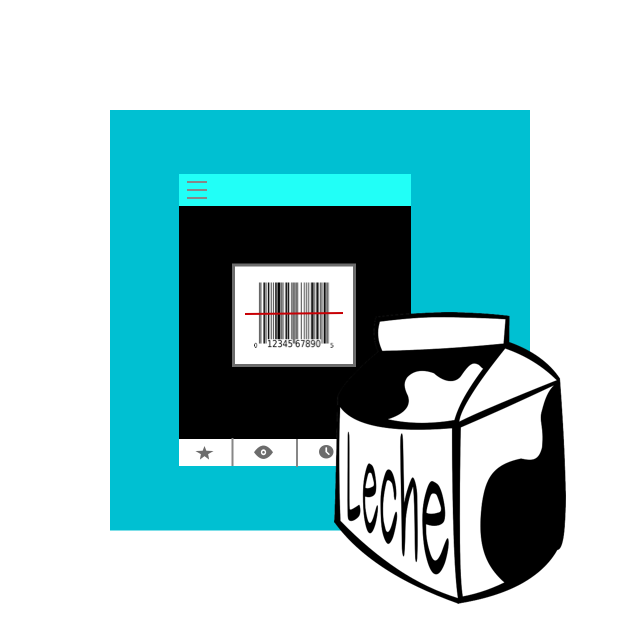 Add product carefully. 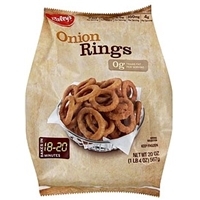 Sliced onions, enriched bleached wheat flour (bleached wheat flour, niacin, reduced iron, thiamine mononitrate, riboflavin, folic acid), bleached wheat flour, vegetable oil (soybean and/or canola oil), water, yellow corn flour, potato starch, contains 2% or less of caramel color, paprika oleoresin color, partially hydrogenated soybean oil, salt, spice extractive, sugar, whey, yeast.caution: ice crystals on frozen foods can cause spattering when added to hot oil. 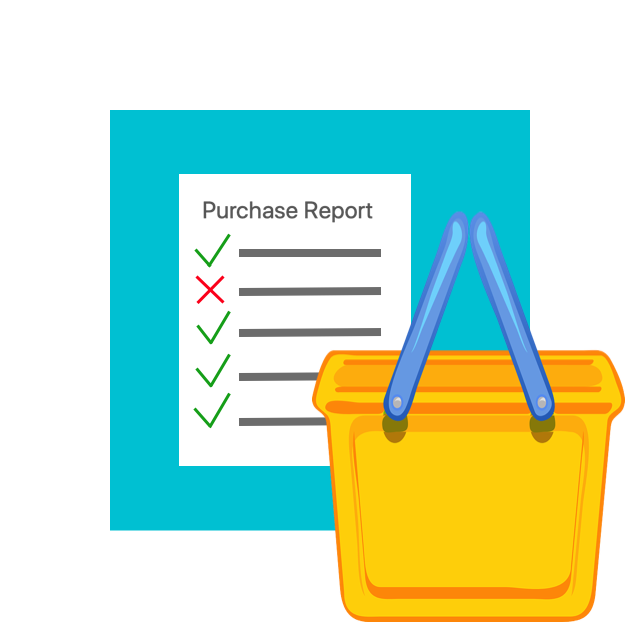 Always add product carefully. 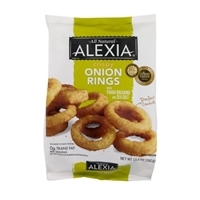 Onion, bleached wheat flour, water, vegetable oil (soybean and/or canola oil), yellow corn flour, wheat flour, salt, modified corn starch, corn starch, black pepper, dextrose, leavening (sodium acid pyrophosphate, sodium bicarbonate, monocalcium phosphate), sugar, sea salt, dried whey, yeast, cellulose gum, nonfat milk, whey.contains wheat, milk. 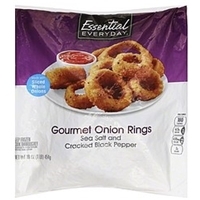 Diced onions, enriched wheat flour (wheat flour, niacin, ferrous sulfate, thiamine mononitrate, riboflavin, folic acid), vegetable oil (soybean and/or canola), corn starch, wheat flour, water, modified corn starch, contains 2% or less of calcium chloride, caramel color, cellulose gum, leavening (sodium aluminum phosphate, sodium bicarbonate), oleoresin paprika (color), salt, sodium alginate, spices, sugar, whey, yeast, yellow corn flour.contains milk, wheat. 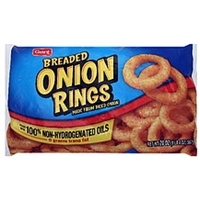 Onions and dehydrated onions, soybean oil and/or canola oil, enriched wheat flour (flour, niacin, iron, thiamin mononitrate, riboflavin, folic acid), water, wheat flour, yellow corn flour, cornstarch, sugar, modified corn starch, wheat starch, salt, sodium alginate, dextrose, dried yeast, color (caramel, oleoresin paprika), natural and artificial flavors, leavening (disodium dihydrogen pyrophosphate, sodium bicarbonate), nonfat milk, whey (milk), sodium tripolyphosphate.contains: wheat, milk. 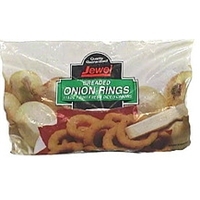 Diced onions, enriched wheat flour (wheat flour, niacin, ferrous sulfate, thiamine mononitrate, riboflavin, folic acid), vegetable oil (soybean and/or canola), water, yellow corn flour, modified food starch, corn starch, wheat flour, contains 2% or less of calcium chloride, caramel color, guar gum, leavening (sodium aluminum phosphate, sodium bicarbonate), oleoresin paprika, salt, sodium alginate, spice, sugar, whey, yeast.contains milk and wheat ingredients. Ice crystals on frozen food can cause spattering when added to hot oil. Add product carefully to hot oil. 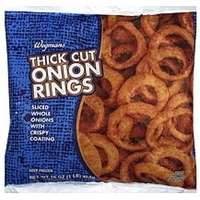 Brand/Manufacturer: wegmans onion rings Wegmans Food Markets, Inc. Onions, soybean oil, water, breader (wheat flour, unmodified corn starch, sea salt, soybean oil), batter (wheat flour, unmodified corn starch, sugar, sea salt, yellow corn flour, yeast, dried whey, onion powder, leavening [disodium dihydrogen pyrophosphate, sodium bicarbonate], garlic powder, spice, yeast extract), bread crumb (wheat flour, sugar, yeast, soybean oil, sea salt).allergens: contains milk and wheat. 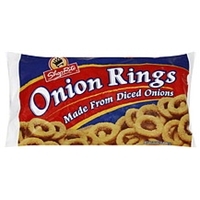 Diced onions, enriched wheat flour (wheat flour, niacin, ferrous sulfate, thiamin mononitrate, riboflavin, folic acid), vegetable oil (soybean oil, and/or canola oil), wheat flour, water, yellow corn flour, corn starch, modified food starch, contains 2% or less of sugar, salt, sodium alginate, guar gum, yeast, whey, leavening (sodium acid pyrophosphate, sodium bicarbonate, monocalcium phosphate), calcium chloride, caramel color, oleoresin paprika.contains milk, wheat, soy. 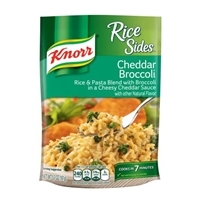 Enriched parboiled long grain rice [rice, niacin, ferric orthophosphate (iron), thiamin mononitrate (vitamin b1), folic acid], enriched vermicelli [wheat and durum flour, niacin, ferrous sulfate (iron), thiamin mononitrate (vitamin b1), riboflavin (vitamin b2), folic acid], whey, cheddar cheese (pasteurized milk, cheese cultures, salt, enzymes), maltodextrin, salt, broccoli (dried), onion (dried), corn starch, potassium chloride, yeast extract, natural flavor (milk), high oleic sunflower oil, butter (cream, salt), broccoli powder, parsley (dried), lactic acid, torula yeast, annatto extract (for color), disodium guanylate, disodium inosinate, cabbage powder, potato starch, sugar, calcium lactate, nonfat milk (dried), onion powder, soy lecithin (dried).may contain sulfites. 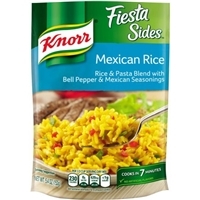 Enriched parboiled long grain rice [rice, niacin, ferric orthophosphate (iron), thiamin mononitrate (vitamin b1), folic acid], enriched vermicelli [wheat and durum flour, niacin ferrous sulfate (iron), thiamin mononitrate (vitamin b1), riboflavin (vitamin b2), folic acid], red and green bell peppers (dried), hydrolyzed soy protein, onion powder, corn starch, salt, maltodextrin, chicken fat (dried), (with rosemary extract to protect quality), potassium chloride, cilantro (dried), spices, autolyzed yeast extract, jalapeno pepper powder, disodium guanylate disodium inosinate, natural flavor (milk), chicken broth (dried), sugar, annatto extract and extract of turmeric (for color), garlic powder, whey, nonfat milk (dried), soy lecithin.may contain sulfites.